Who doesn’t want a dress that makes them look smaller? Even my pug wants that. This hoodie ain’t cuttin’ it. I’ve written about pattern camouflage dresses before and how they can help you cover up a multitude of sins. Artists play with areas of light and dark to direct and trick your eyes into believing something that isn’t true. Dark areas recede, light areas pop. Dark areas appear further away, light areas closer. These same techniques can be applied to clothing. 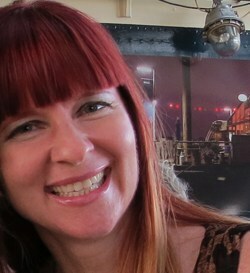 I bought this Desigual dress years ago and found it again when I went through one of my closets of dresses. Yes, I have two closets for dresses. I have long since passed the regular “wardrobe” and crossed into collector territory with my dresses. Don’t judge. This is a discussion for another day, when I’ve got a big bottle of vodka, a jar of olives, ten family sized chocolate bars, a box of kleenex, a pug on my lap, a hot male masseuse rubbing my shoulders and a therapist beside me. My husband persuaded me to buy this dress. I’m married to an enabler and surround myself with enabler friends. I take none of the responsibility whatsoever for my addiction and weakness. My therapist is shaking her head right now, the pug threw up on my lap and the masseuse walked away in a hissy fit. My real therapist is up there in the hoodie. She’s got her own problems. As an illustrator and designer who created patterns for many years I’m always drawn to bold bright patterns. 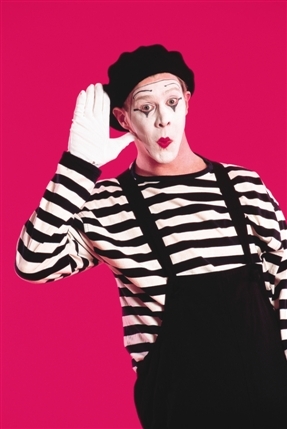 What I wasn’t so crazy about was the “mime” stripes on the arms. The dress may have crossed over into Cirque du Soleil territory. It wasn’t enough clownish enough to dissuade me from buying it. I bought the dress in the end because it made me look 10 lbs thinner thanks to the contrast in patterns and the clever mix of dark and light areas. The fact that it elongated my legs because of the high waist and shorter hemline wasn’t lost on me either. The dress is 100% cotton, so comfortable and a welcome change from synthetic fabrics. It also looks great in my office. I become one with my wall art. Just so long as my therapist doesn’t shed all over my black leggings I’m good. Do you own any dresses that make you look smaller? Or are you one of the lucky ones, very happy with the size you are? That is a great Friday tradition! Patti eating a Pattie : ) you must get a photo of that. Desigual has such fun dresses! Yours looks fantastic on you! Oh that I would have your problem! LOL I know what you mean though, we always want what we don’t have. You look so adorable! And the pug gave my husband and I the hugest giggle in the hoodie! I’ve heard of that brand before and so want to find some pieces. Have a great weekend and thank you for your clog help and super flipping funny posts! Zoë is the best isn’t she? Oh stop it! Zoe in a hoodie! Toooooo cute. You look so great in this dress. It really is flattering and it makes me smile. As a fellow small person I find that higher waists and shorter lengths really are more flattering on a small frame. The thing that I struggle with though is that this style is a bit too youthful for someone my age and I look like I’m auditioning for the senior center production of “Annie.” Any suggestions? This is a really good question Connie! For example about a year ago I put on this dress and felt it was too immature for me. Then I put it on last week and loved it. Goes to show that self confidence and attitude is everything. I think if a dress is quite short tights or leggings are a good bet for the more experienced women. If you’re able to wear a bit of a heel it also skews a bit older rather than flats. They always help with us shorties too. Truly though the best bit of advice is to own it. Ain’t no one gonna mess with you when you act like it was meant to be. Thanks for the advice. “Experienced” Yeah that’s me. Ha ha. I was curious to see what you would say. I have always loved heels and platforms but my funky hip won’t let me wear them for now. Own it. That is the BEST advice. Real clever dressing going on here. 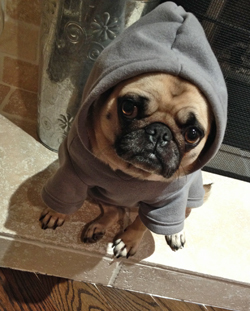 (Although I’m not so sure about that pug-in-a-hoodie look.) I love to be taught dressing up lessons that actually apply to my body type, hurrah! Also, I’m not only loving the fab filing cabinet with those patterned drawer fronts, but I adore that wall festooned in flowers and butterflies. What a beautiful and inspiring work space, (big sigh). that I made using an old Ikea case and scrapbook papers I’d designed. The floral wall treatment was a compromise instead of doing wallpaper. I also did my husband’s office. I really enjoy interior design and home decor. My office used to be in my unfinished basement (that is still where all of my painting/sewing/jewellery making/non computer creation takes place but once I made my upstairs office so pretty it really became my favourite spot in the house. 🙂 Desigual has lovely dresses. Sometimes one just has to look long enough for the right color combination in the right size. I have a very old, very colorful Desigual skirt from a time where they weren’t that popular yet. It’s red with a multitude of colors, patterns and materials and I wouldn’t want to miss it, as it flatters my shape. I’ll be your enabler-friend if you be mine! Cotton is my favorite fabric. I would love to see your dress collection! I think this one is fun, and it does look great on you. 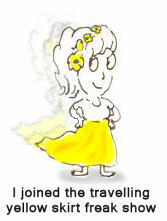 I would love to be one size smaller – but when I got there, I’d probably want to be one size smaller……..etc. So I guess i’ll be happy where I am – a little firmer would be nice though :)! Yes that is the problem in life…we never seem to be happy where we are. It is colorful and playful and you are right, very, very adorable! Great dress! It’s fun and looks great on you. Is there anything cuter than a pug in a hoodie? What a doll! I’m not sure about the self confidence and attitude thing as I get older – it’s probably a case of me getting more immature. And well, maybe be more confident in my immaturity. I LOVE this dress and these boots, as you KNOW! Hahaha, Zoe, she makes me smile so hard. You are dead right. But hey… you do have a beautiful hourglass figure. This dress just enhances it. Well styled my dear. I love the enabler husband and friends. I am surely one of them haha. And I have the same sort of husband and friends. It is like being an alcoholic… they surround themselves with drinkers too. When you talked about the masseuse etc. I was willing to fly over haha. And Cloe in her hoodie whaha.. Sorry but I made me laugh. so cute. This is a great dress and I agree that colors and shapes can really give the illusion of a slimmer figure. I am all for looking 10 lbs lighter and will buy anything that makes me look smaller. Zoe looks so much cuter in her hoodie than all the teens and 20-somethings I see every day. Cute dress, and your legs do look long in these photos. I don’t know that I have any dresses that make me look smaller. I do have a couple that make me look curvier, which I like. I absolutely love the contrasting stripes on the arms, that is an amazing dress! Desigual? I knew I loved that dress!! You look fab in it! They are a very unique brand. Great writing, you and Melanie need to start a woman’s humor magazine. I just read this to Par and he said I need your therapist, haha. I think it’s totally fine that we collect dresses and other such items and have three separate closets, Ok, bring on the chocolates! 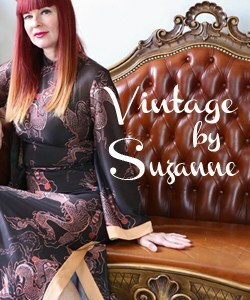 Fabulous dress, Robert did well in enabling you to purchase this one. It really does look incredible on you, that pattern(s) are to die for! And, it’s also a wear all season kind of dress, just switching out those booties for slip ons in the summer and your good to go. You can have my therapist, but I must warn you, she is quite expensive. Non-stop doggie bones and belly scratches. lovely dress (as usual), and fabulously flattering shape!, I’m loving all those Desigual and faux-desigual mixed prints, and this one looks amazing, and really comfy too!, that striped sleeves and sides are really cool! That dress is so cool! I’ve never seen a combination of patterns like it–completely unique. The fact that it’s comfortable only adds to the awesome factor. This is the first time I have seen anything from this company that I liked. It looks great on you! Desigual is all over NL, very popular and feeds into their love of crazy patterns and colors. I first saw it here and never liked it. It just isn’t my style, too much going on for a matchy matchy girl like me. You sure can rock a pattern. Me on the other hand, I am so matchy matchy that my freaking underwear have to match my outfit (no one sees it, but I know it’s there) Heck I wouldn’t even mix pink underwear with a red outfit. (yes I know some people think these colors go together).